Clouds loomed overhead and light rain drizzled on the riders as they lined up for the start at Sunday’s Dare to Race Grand Prix. The new shorter .8 course is great for spectators and the riders alike as it makes for an aggressive race. Just as the day before at Rosena Ranch Circuit Race, it was smaller field but that didn’t stop the riders from racing hard and teams having three to four riders per team lining up. In the the first few laps, the attack started to take place. After about fifteen to twenty minutes into the race a group of six riders including Michael Barker (SoCalCycling.com Team), Monster Media teammates Danny Kam and Nate Deibler, Patrick Caro (Go Fast), Dubin Sanchez (Team Velo Sport) and Kevin Barker (Velocity) escaped. The break sat off the front about ten to fifteen seconds for most of the race with some riders falling out of the break, only to be replaced by fresh riders tagging on one by one and seeing the lead group swell to an eleven rider group. With about fifteen to twenty minutes to go the last rider to get across was Jason Cianfrocca (SoCalCycling.com Team). With eleven riders finally coming together and most teams having two riders a piece the gap finally grew to thirty seconds very quickly and got out of sight of the pack. With the final laps in progress some of the riders didn’t want to wait around for a a sprint. However, since most of the riders had teammates in the break they didn’t want to let something just roll up the road without sacrificing a teammate to ensure they had their rider in position for the sprint. After coming around the last corner and absorbing the daring attack from Sugyo Motobaru’s solo move tok some sacrifice to bring back and Nate Deibler was the one to bring it all back together. With Danny Kam (Monster Media), Jason Cianfrocca (SoCalCycling.com Team) and Bader Aqil (Big Orange) being the strongest sprinters in the eleven man group. 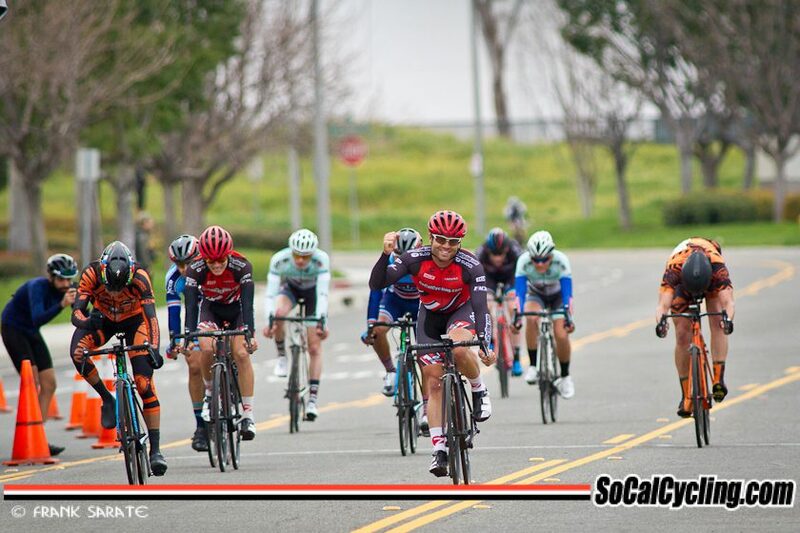 It was a drag race all the way to the finish line with Jason Cianfrocca (SoCalCycling.com Team) taking the sprint for 1st, followed by Bader Aqil (Big Orange) in 2nd and Danny Kam (Monster Media) in 3rd. It was good to see the SoCalCycling.com Team come together as a team and see some of the miles and hard work put on in the winter start to pay off for some of these guys. It was good to see Leo lap the field the previous week and get second. Copyright © 2015 - 2018 - Site Design © Echelon Design - Photography © Christy Nicholson / EchelonDesignPhoto.com - All Rights Reserved.